Friday, 5 April, the last full day of the walk, was for my mom and dad. Without them I would be unable to do pretty much anything in life because, well, I probably wouldn’t be here to start with. But seriously, thanks Mom and Dad. Your restraint when your sons have gone off to do unusual things that would worry any parent to death is, I think, one of the greatest gifts parents can give their children. 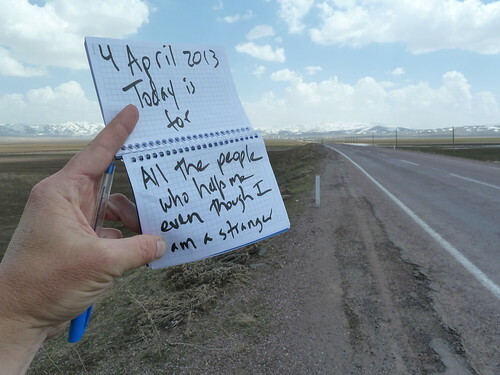 I get a lot of help from strangers who, I have to continually remind myself, consider me a stranger too. It astounds me that people here stop regularly to help, or offer help to, a foreigner who barely speaks the local language and is, get this, out WALKING in a deserted area miles from the nearest town, and who talks some bizarre BS about walking all the way across the country. And they offer that help without even blinking an eye, as if something unusual happens here every day. Because, as I’ve learned, it kind of does. This was the walk’s highest point. I reached it Friday. 7500 feet (2300 meters) above sea level. For some reason I was expecting a marching band, a big parade, and a ribbon-cutting ceremony of some sort, but all I found when I actually got there was a stiff headwind. No traffic, no people, nothing but wind. Today I walked to Saray, the last little town I’ll see on the way to the border. By the way, my heavily-accented Turkish doesn’t work really well around here. 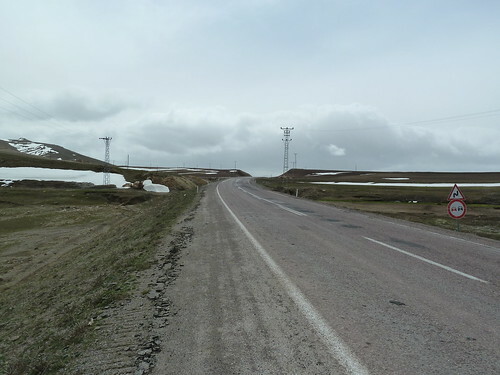 "Is this the road to Saray?" comes across as "Is this the road to Syria?" and is more likely to garner the response, "No, this is the road to Iran" than anything else. Tomorrow’s walk will be 19 kilometers to a turnoff that marks the "5 km to go" point, where I’ll leave the rest for Saturday, 13 April. For more than 3 months I have been walking mostly 30’s (30 kilometers, or 19 miles, in a day). Today was the last such day. I have two days left, and they are both under 20 kilometers each. It takes me 6 hours to walk 30 kilometers. I often walk those 6 hours without stopping, not even for a few minutes, not even once. I am amazed and thankful that my hips, knees, and feet can keep moving like that for 6 straight hours, day after day, knock on wood. The camera battery died on me in mid-sentence too, and I didn’t even bother to change to a new battery. I just thought, “I guess we’re done then,” and stuffed the camera back in my bag. Gary was one of the Resident Heads (read: adult supervision) at my dorm at the University of Chicago. We have stayed in touch since. He is a retired teacher, runs marathons like a maniac, and does things like hike the Appalachian Trail. 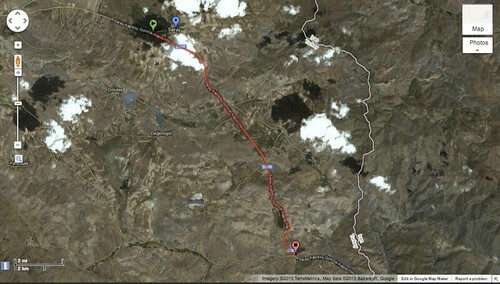 Today’s walk was 30 kilometers, from Van to the town of Erçek. The walk started at an elevation of about 5550 feet (1700 meters), but spent most of the time between 6100 and 6200 feet (1900 meters). Before I came to Turkey I walked 2000 kilometers (1240 miles) just to make sure my body was up to the task of walking 2000 kilometers. 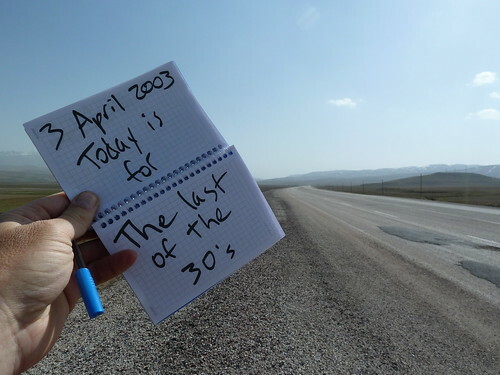 When I would approach a major milestone (500 miles, for example, or 1000 miles) I would find myself feeling that those miles were more difficult than the miles that preceded them. My spirit would drag. I would have a hard time getting out of bed in the morning, or I would have to dig unusually deep to finish the day’s walk. “Why is that?” I started asking myself. Why is mile 999 harder than mile 257, or mile 676, or mile 819? I am using that same lesson here in the final week. Tomorrow’s 30 kilometers (19 miles) will be just like all the other 30 kilometer walks I’ve done. Wednesday’s 30 kilometers will be just like tomorrow’s. Thursday’s 18 kilometers will be just like every other 18 kilometer walk I’ve done, and Friday’s 16 kilometers will be just like every other 16 kilometer walk. And then boom, I’ll be done. The last mile isn’t the hardest unless I think it is. Thin flatbread, mild white cheese similar to mozarella, and, just for additional greasy goodness, plenty of butter. 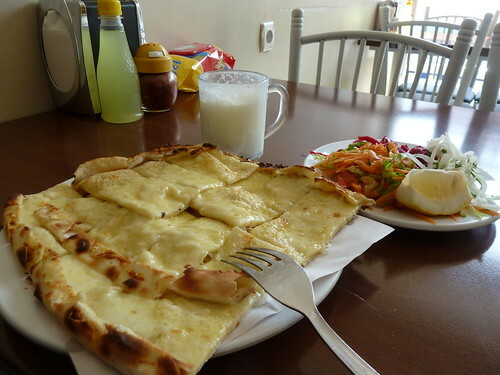 Ayran and salad on the side. If I had to live the rest of my life on kaşarlı pide, ızgara köfte, and kuru fasulye ve pilav, I’d be fine with that.